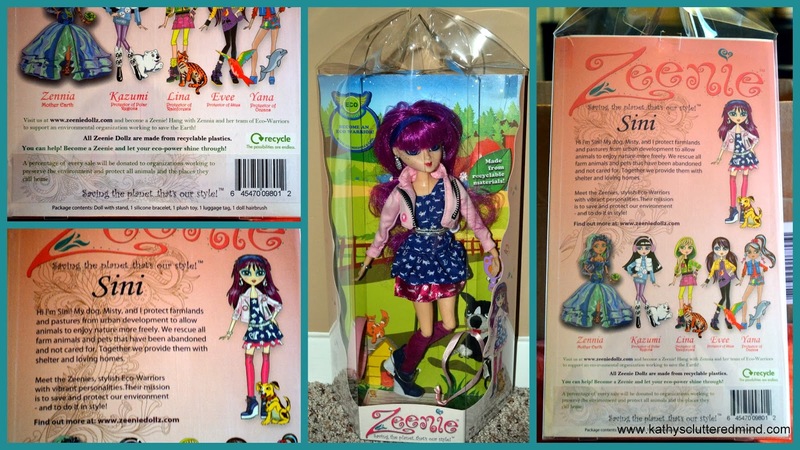 The concept of Zeenie Dollz started out as a sketch by Hansini Wadhwani the creator, designer and inventor of this adorable planet saving doll series. Hansini showed her supportive mother, Laxmi Wadhwani her sketch of Mother Earth, a girl with flowing blue hair. And together this mother-daughter team brought that sketch to life. Zennia (Mother Earth) was the first doll in the series. From there the duo worked together to create 5 more dolls. Their belief in this one of a kind concept, creativeness and passion for the environment shines through in these beautiful dolls. We received the Sini, Zeenie Doll to review. Sini was so amazing that I decided she would make a very special Christmas gift for my 7 year old daughter so these are my personal thoughts, however I will come back and update this post (at the bottom) with Gwyn's thoughts. I was very intrigued by Zeenie Dollz and really felt that this was the perfect item for us to review for several reasons. First Zeenie Dollz is a small, family owned and operated business which I am a BIG advocate of. Secondly as a homeschool mom I try to teach my children about the importance of everything and everyone around us and show them that we can make a difference. As a family we enjoy helping others and making our World a better place. And thirdly they create a one of a kind modest doll with amazing values perfect for little girls ages. If you read my blog often or follow us on Instagram then you know I have a 7 year old daughter who is VERY passionate about animals, the environment and nature. Her passion is to own a horse farm/animal rescue when she is older. She even has a blog Adventures Of A Homeschool Cowgirl dedicated to her love for animals. When I read about this company I just knew we had to review one of these dolls. They are the perfect doll for little girls who have a deep passion for the World! These 12 inch, ball jointed dolls are absolutely beautiful. Each one has a unique look and style. They sort of resemble the Bratz dolls, but I personally think they are prettier and I like their outfits much better. Their outfits are colorful, stylish, beautiful and reflect their different eco-powers. Gwyn is going to love Sini's pink and purple dress which which has cats and dogs on it. Each Zeenie Dollz comes with a stand, silicone saving the planet bracelet, plush toy sidekick, luggage tag and hairbrush. What makes these dolls really SPECIAL though is that each one is made from non-toxic recycled materials, right down to the packaging the dolls come in. The package is actually a biodegradable plastic. The Zeenie dolls have 12 ball joints which provide flexibility and movement during play. She can hold things in her arms, strike various poses and tackle any eco job that may come her way. And thanks to the included stand she can even stand all on her own. Their beautiful colored locks can be combed and styled to perfection. And their jewelry, shoes and clothing can be easily removed. My favorite feature is their large, striking eyes! Choosing a doll for Gwyn was not very difficult because Sini represents her passion so well. Sini is protector of farmlands and pastures. As you may know my daughter volunteers quite often at a local horse rescue that saves the lives of horses and other animals. Sini like Gwyn has a passion for rescuing all farm animals and pets that have been abandoned and not cared for and takes them in to provide them with shelter and loving homes. Sini also fights against urban development so that animals can enjoy nature more freely. There are 6 dolls in this series and each on has a different eco-awareness job. Their goal is to bring to light their environmental cause that needs attention and educate young girls. One more really cool thing about the Zeenie Dollz is that a percentage of every sale is donated to organizations that are working to preserve the environment and protect all animals and the places they call home. These dolls are way cooler than Captain America who was the Earth saving hero of my time. Zeenie Dollz would make a fabulous gift for any eco warrior girl. 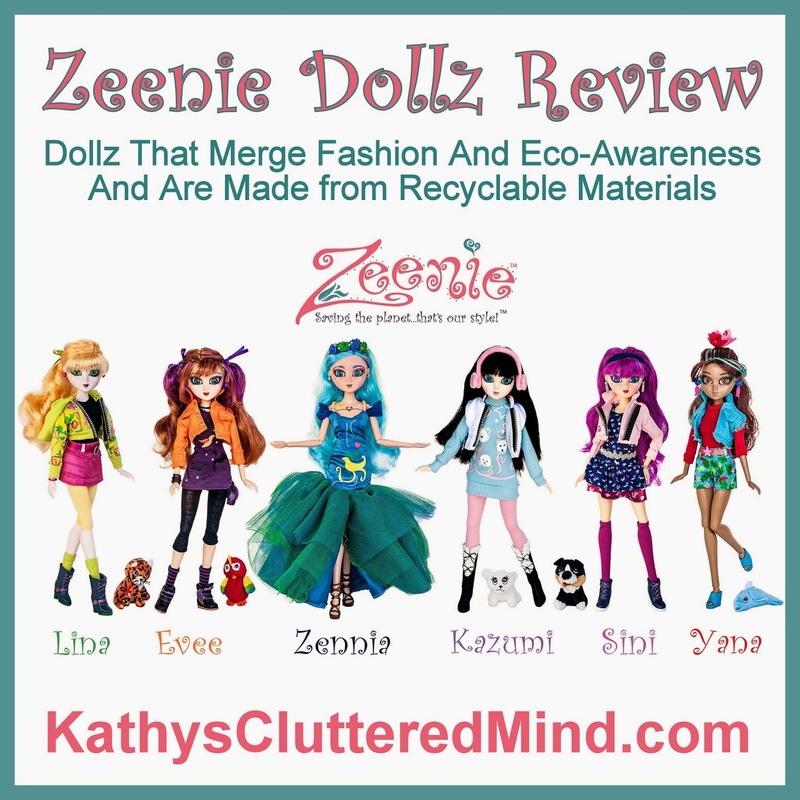 Be sure to also visit the Zeenie Dollz website for more information on each of the dolls, games, printables, puzzles, ways you can help save the environment and more. There is even a Zeenie Dollz App for iPhone!!! And this page has great Zeenie reminders for children. Gwyn's (age 7) review: After Christmas I will come back and update the post with Gwyn's thoughts, some more pictures and maybe even and video! I will be sure to include a photo of her opening Sini. Each doll is available for purchase on the Zeenie Dollz website for $39.99. Zeenie Dollz can also be found on Amazon. Soon they will also be available from retailers Nationwide.